For Immediate Release: Posted On 2/25/2013 By Industrial Magnetics, Inc.
Industrial Magnetics, Inc., has designed a rotary- style, magnetic Drawer-In-Housing to remove ferrous metal from powder & bulk processed products with difficult flow characteristics and a tendency to bridge and choke. This magnetic separator is ideal for products that require a high degree of product purity, but have a higher moisture content or particle size, such as flours, cake mixes or corn starch, making them difficult to process through stationary tube magnet housings. 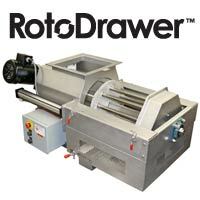 The RotoDrawer™ features a motorized, cylindrical configuration of Rare Earth magnetic tubes that continually rotate through a gravity-fed product stream. The rotational design of the magnet, along with the unique splitter bars, break up any clumps of product and keep the flow moving through the housing while capturing ferrous metal contamination and purifying the product. IMI’s Rare Earth RotoDrawer™ is available in either a Simple-Clean or Self-Cleaning design to simplify the removal of collected metal and prevent any metal wash-off back into the product stream. Standard sizes range from 8"x8" to 18"x18" inlets and outlets, with custom designs and sizes available to fit exact application requirements.